The quesadillas form an indispensable part of the diet of almost all the Mexicans. It is one of the Mexican recipes that is the most simple and easy to prepare – it only consists of tortillas folded in half with melted cheese. But one of the quesadillas’ attractiveness is that they can be enriched with distinct and tasty fillings. The filling that we are going to use in this recipe consists of the combination of mushrooms, epazote and onion. When these ingredients mix with the cheese... the cheese’s soft flavor and the mushrooms’ wild touch are complemented . Although from this combination the onion’s strong notes can also be felt and the epazote’s touch. Oh and we cannot forget the maize’s flavor in the tortillas that gives a precise flavor. – You can enjoy this recipe at breakfast time or as a tasty appetizer. To make this recipe first you will cut some ingredients, then the filling is prepared and at last the quesadillas are made. You really won’t have any problem. To make the quesadillas a cheese that melts has to be used like the Oaxaca cheese, the Chihuahua cheese, the Monterey Jack cheese, etc. Preferably use fresh epazote to make the filling, if you don’t get it use 1 teaspoon of dried epazote. If you prepare the corn tortillas the quesadillas’ flavor will be very fresh. This recipe is for 6 quesadillas. Clean 5.2 oz of mushrooms. Finely chop the mushrooms that were cleaned, 1/4 of an onion and 1 epazote sprig; then set aside. The Mushrooms that were minced. The epazote is used to give a very Mexican touch and flavor to the quesadillas. Mix the frying pan ingredients and fry them for about 5 minutes, until the mushrooms are moderately fried and the water that they release has completely consumed; stir regularly. Then set aside. Heat on a griddle over medium heat 6 corn tortillas for about 20 seconds per each side, until they soften. 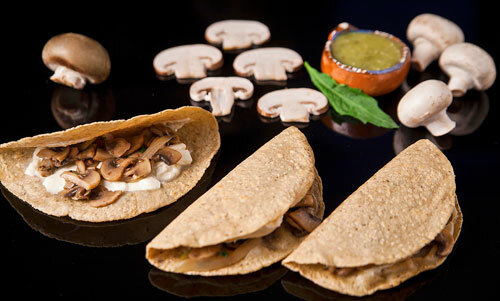 Heat the mushroom quesadillas for approximately 1½ minutes per each side, until the cheese has melted. While the quesadillas are heated they can be pressed gently so the filling unites with the cheese and they will heat faster. Recommendation: The quesadillas are ready so you can put them your favorite salsa. Variation: Prepare these quesadillas with blue tortillas and feel the difference. Did you like the Quesadillas? “La Banderita Corn Tortillas" are thin, they have a good taste and they don’t break; therefore they are excellent to make quesadillas. The “Oaxaca Cheese Los Altos" melts very well – it also has a soft and creamy flavor; ideal for quesadillas. This is a little trick of the Mexican cuisine... you can also put the quesadillas in a tortilla container so they will remain warm and soft for a longer time.